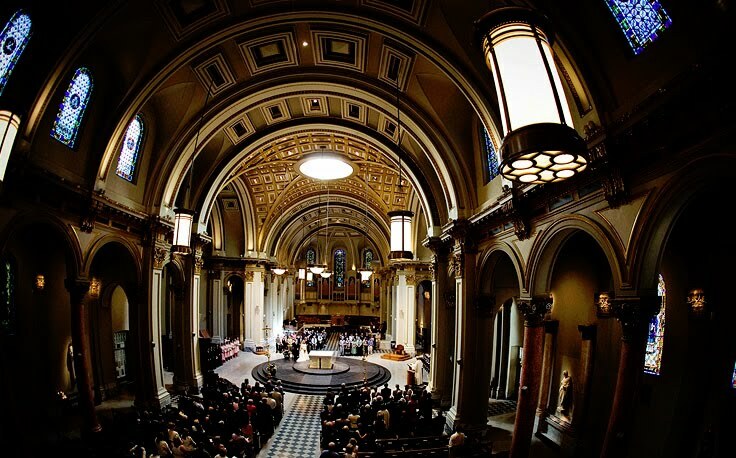 This is the interior of St. James Cathedral, just a stone’s throw from my new place and the home of the Archdiocese of Seattle (the cathedral, not my new place). If I knew what an Archdiocese was, I could tell you. As it stands, you’ll just have to Wikipedia it, or phone the Pope. Each day as I walk past this architectural giant I crane my neck so as to take in the elements that make it so stunning, sometimes cutting through the courtyard in order to listen to the fountains and gaze at the marble sculptures. Alas, I’d never seen the inside. Ironically, on my way home from the Gay Pride Weekend festivities on Sunday, I am confronted by the peals of the bells of St. James as I pass by, and to my utter delight the doors happened to be open, the bells no doubt a “last call” to parishioners to get their asses inside. I pass by churchgoers, making my way to the large, bronze-cast doors to get a peek into the nave of this oft-admired structure, alas it is obscured by the large, rose-marble columns flanking the interior. I try the opening on the other side. Damn. It occurs to me to take a few steps onto the threshold, but my fear of being struck down by fire and brimstone gives me pause. I climb down the portico steps in solemn defeat. As I ascend the steps back towards the entrance, the short, roundish, smiling usher who watched me peek in earlier gestures me inside, a knowing look of amusement on his face. Now, mind you, I hadn’t been in a church since May of 1996, the day of my ill-fated nuptials. Mostly due to the fact that, despite my fixation with secular architecture, I do not identify myself as Christian, so attending church services seemed pointless and until now, didn’t appeal to my wicked, hedonistic, foul-mouthed self. But I wanted to see the interior, dammit. And this seemed the most logical and efficient way of going about it. Growing up, my family identified themselves as Baptist. Went to Sunday school some as a child, nothing exceptional. We stopped going because though my mother believed in God, she did not believe in religion. Which was just fine by me as I found church to be exceedingly boring and sometimes thought I was being dragged along as punishment for something. Having infiltrated St. James as a non-Christian and thus a non-Catholic, I thought it best to hide in the back row of pews lest I be found out. I was completely unfamiliar with the ritual and protocol, my only urge being to bust out my sketchbook during the service. However, the Catholics make this impossible as every five minutes you are standing, sitting, kneeling, standing again…I felt as if I had signed up for an aerobics class. That and I wasn’t sure how my doodling in church would be received, and I didn’t want to be kicked out. Not that they would have, mind you, but like I said, unfamiliar with protocol. And though I’m not a bible-thumper I do know that doodling in church is not one of the seven deadly sins. Thanks to that Morgan Freeman and Brad Pitt flick. The interior was massively beautiful, screaming of a Romanesque Neo-Classical Renaissance hybrid that I admit choked me up for a moment. I spent most of the service looking up instead of at the preacher-guy, noticing details like the Corinthian capitals, instead of having rosettes between the scrolls, had cherub faces with wings, a detail I tried to capture with my camera phone later but failed miserably due to lingering battery power. The chanting and singing was beautiful, however…made the impact of the environment completely surreal. It amazes me what faith can inspire in art and architecture. I passed on the stroll up to the altar for the wine and cookies bit, feeling like a complete poser and again fearing the fire and brimstone aspect. I did enjoy the shaking hands with my pew-mates and the exchanging of the “peace be with you”‘s, even receiving a hug from an elderly woman who was suffering from a L’Air du Temps overdose. I put a big, hefty fiver in the collection plate, showing my gratitude for being allowed in to admire the place and I figured it was cheaper than a movie, even if I did pass on the free wine. After the service was over (and the 50th “let the lord be with you” “and also with you”) they let me hang out and take several photos with my rapidly-dying camera. I must confess that I did pause in my gawking long enough to listen to the sermon, which, even though littered with scripture, was ironically applicable to this phase in my life and got me thinking about certain things a bit…which caught me completely by surprise. Who’d a thunk it. I go to church for the architecture and come away with a message. Don’t think I’m converting or anything. Hell no. I like sinning too much.